Learn to trim your grocery bills. Over the past two years, food cost increases were record breaking. The biggest troubles began in 2010 as droughts, floods and freezes started to affect everything from wheat and corn to soy, coffee and beef. As a parent, you know how difficult it can be to meet each family member’s food requests without breaking the bank— especially during the current economic climate. 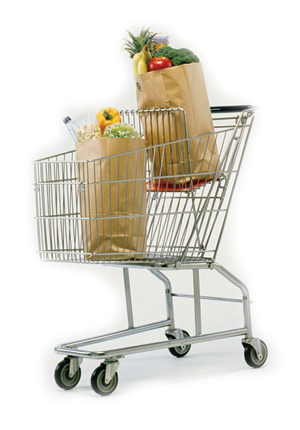 However, if you put the following pointers to the test, you’ll become an efficient shopper who saves major green. Avoid making a shopping list. Instead of deciding what you want each week, buy only what’s on sale. And don’t forget unadvertised sales, too, which often offer a huge selection. Purchase items in advance. Most foods go on sale about once every 12 weeks. Therefore, you should stock up on everything except milk and produce when prices are slashed— even if you don’t need it at that exact point in time. Build up your inventory. It’s difficult to save money when you have your heart set on a certain dinner. When you take a recipe into the store, you rarely find all the ingredients on sale. That’s why it’s not ideal to act on a whim of what you want to cook. You’ll eventually get what you want by investing in sales and building your at-home inventory. Stack the deals. Combining a sale item with a manufacturer’s coupon, store coupon and register rewards means great savings. It may lead to a discount of 67 percent or more. Keep a coupon e-file. Thanks to the Internet, the days of clipping and filing are gone. Use a free coupon tracker, like www.thegrocerygame.com, to find coupons by insert date. Members get deals and use a “gather coupons” feature to help save an average of $514 a month. Buy the limit. Any time you see a sale with a limit on how many you can buy, that’s a good sign of a loss leader, which means it’s a great bargain. Hit the web before you hit the store. Many sites let you access unadvertised sales and lead you to complementary coupons. This saves you time and money! Stock up on dairy products. Yogurt and organic milk have up to a five-week sell-by date. So when a yogurt four-pack is on sale for $2, it’s time to invest. If you use a $1 off coupon on this $2 sale, you can get it for $1. Wow! Lose weight on veggies and fruit. When priced by the pound, make sure produce is as dry as possible. Water adds weight and increases the price. Steer clear of impulse purchases. You go to the register because you’re finished shopping. Don’t rack up your bill on unnecessary items, such as gum and gossip magazines. Teri Gault is CEO and founder of www.grocerygame.com.